So says R. David Lankes in the opening moments of his presentation School Librarians as Facilitators for Learning embedded below. We represent the fundamentals of the future of libraries. Yes! High Five Folks! His Atlas of New Librarianship is a bible, a book to take so much out of. He says: The mission of librarians is to improve society through facilitating knowledge creation in their communities. And he is talking to you school librarians. I’m quite a lot in love with his messages, pretty much all of them. Watch this presentation and take on board what he is saying. He is going to give you lots of examples of how you can think about why you do the things you do. Not the what you do. Yes, it takes an hour but yes it is an hour well spent. Great PD. Really great PD. Watch The Vlog Brothers perform a live concert at Carnegie Hall. It is great! the music is lovely and the sentiments in the songs resonate! Lovers of the Green Brothers will be in heaven! But I digress. It’s that time of year when various book-related peeps put together lists of the best books of the year that’s nearly over. Open in my browser tabs lately are these “Best of 2012” beauties. Why don’t you start making your own “to-read” list for the summer now! Or make notes of titles to buy for your school library in 2013. Get your buying list notebooks or apps out to take notes for when your budget is all filled up again, cos there are some things you’ll want to buy/read on this list folks. This is a list of the new cool stuff hitting the shops in the States this winter. Books for every level are here. Some are out already here, a couple are in my ‘I’m taking this home for the holidays box’ right now. Here is the link to the list. And look at that, here is a link to the downloadable shelf talkers. Oh how I love shelf talkers. Link from 100 Scope Notes – full of the power of awesome. I stumbled upon this interesting story via a Storify link. There are three parts to Linda W Braun’s Young People, Reading and Libraries. You will need to delve into it yourselves and pick out the gems but there are certainly some gems for secondary school librarians in the report but also in Linda’s storify which has plenty to mull over without even leaving the first page. 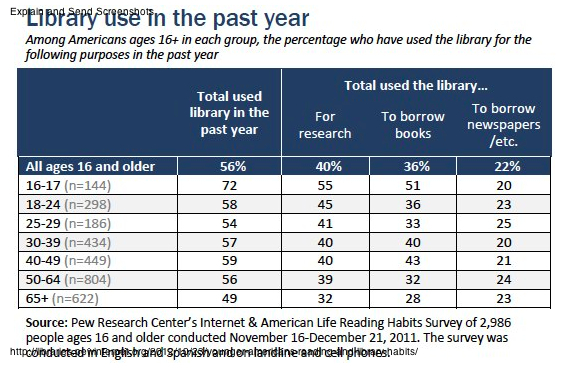 Items which I found particularly interesting were the ebook readership, interesting stats. I’m interested in these figures as I decide whether to delve into the ebook platform and these stats make me feel rather better about delaying my decision. Go look at the figures there. Also interested in the graph on where teenagers get their book recommendations from. I wonder if these stats would be the same here in New Zealand. Probably the same. And what would happen if they surveyed younger students, I think in my school it would be quite different statistics with many of them relying on my recommendations – possibly equal to those of their peers. I do like the idea of students recommending books to each other. That is my ideal world, a sharing of reading joy the “I loved this book, you should read it too!” which happens all the time with adults who read. Anyway the Report itself is here. Part one of the YALSA Storify is here. Science Fiction author Gareth L Powell presented this marvellous speech three years ago, The Role of Science Fiction in our Understanding of the Future, yet it is just as relevant today. Powell refutes the role of the science fiction writer as a predictor of the future, rather suggesting that their aim is to dream up plausible futures, to model a vast range of possible outlooks. By assessing the sociological and technological trends, they show us what may happen if man continues on their current path. What happens if the ice caps melt and sea levels rise by fifty feet? What happens if we discover a way to halt the ageing process and everyone lives for 1000 years? What happens if the government puts a CCTV camera on every street corner? Gareth Powell’s speech is well worth reading – it puts a clear voice to what science fiction is all about.